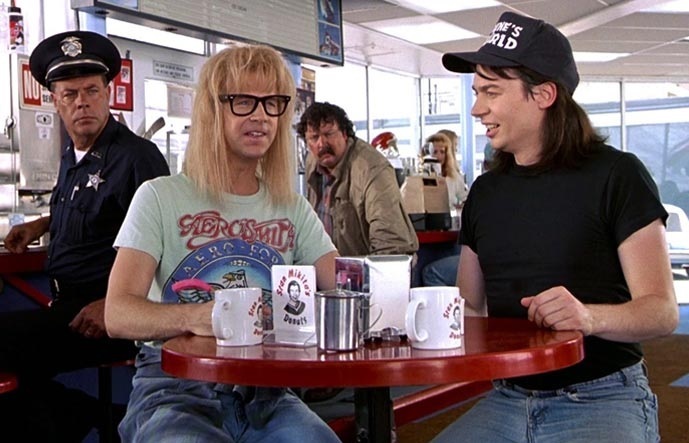 A lot of us were a bit too young when Wayne’s World hit theaters back in 1992 — but luckily, we now have the chance to catch the iconic Saturday Night Live-based film on the big screen. To celebrate its 25th anniversary, the original Wayne’s World is officially returning to theaters. Oh yes. You’ll have the chance to party with Wayne and Garth. And the great news is that it’ll be in a bunch of theaters throughout the United States, so there’s a good chance that you can catch it locally. The movie will only be in theaters next month, on February 7th and 8th — so, it’s definitely a limited time event. And here’s a teaser trailer that aired right before viewers saw yet another classic — The Addams Family — in theaters. The screening will also include a bunch of extras. For example, director Penelope Spheeris will be part of a pre-recorded Wayne’s World-based discussion with Tia Carrere and others who helped make the film that’ll air immediately after. So, if you love movie trivia, and are dying to know more about the making of the movie, you’ll definitely want to buy tickets. Of course, those of you living in Aurora, Illinois will be able to celebrate the film with even more events. From February 3rd through July 4th, the city will be hosting a bunch of Wayne’s World-esque contests and screenings. There’s been no word on whether or not Mike Myers and Dana Carvey will make an appearance, but surely they’d be greeted with open arms. We definitely think that this announcement means it’s officially party time. Excellent.